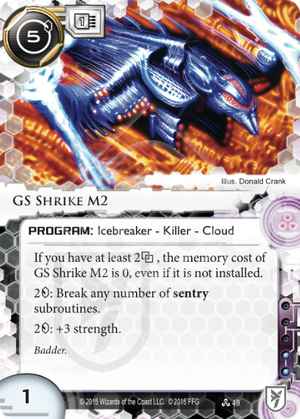 If you have at least 2link, the memory cost of GS Shrike M2 is 0, even if it is not installed. 2credit: Break any number of sentry subroutines. This is undeniably the strongest of Sunny's breaker suite, and I expect to see it in many, many other decks. Before the release of Shrike, there wasn't a really strong choice for a universal, inexpensive killer that could efficiently break weak multisub sentries (Errand Boy, Komainu), strong single-sub sentries (Cortex Lock, Susanoo-No-Mikoto) and the great granddaddy sentry, the high-strength, multi-sub Archer. Faerie and Shiv are single-use, Mimic is fixed-strength, Garrote is too expensive and an MU hog, Dagger and Switchblade require stealth, and Ninja or Creeper are just generally terrible. Shrike has none of those problems. It's a reasonable install cost, and either 1 or 0 MU depending on your link. One base strength is a bit low, but the 2-for-3 boost means that it can boost to higher levels decently efficiently. And the 2-for-all subroutine break helps compensate. All this, in a reasonable 2 influence package. What this means is that if you have a rig of Corroder, Gordian Blade, and GS Shrike M2, the only thing preventing you from getting into a server is your credit pool, and with a Magnum Opus and/or Multithreaders that will not be a problem. Shrike and Multithreader are the key cards which will make big-rig Shaper come back with a vengeance. We've already seen the first draft of this new paradigm with Feisty's Theory of Simplicity, and I expect other theorycrafters will take advantage of the late-game inevitability this breaker provides.